This is a nut and bolt “TOP OF THE LINE” everything restomod. Built from scratch and all new! 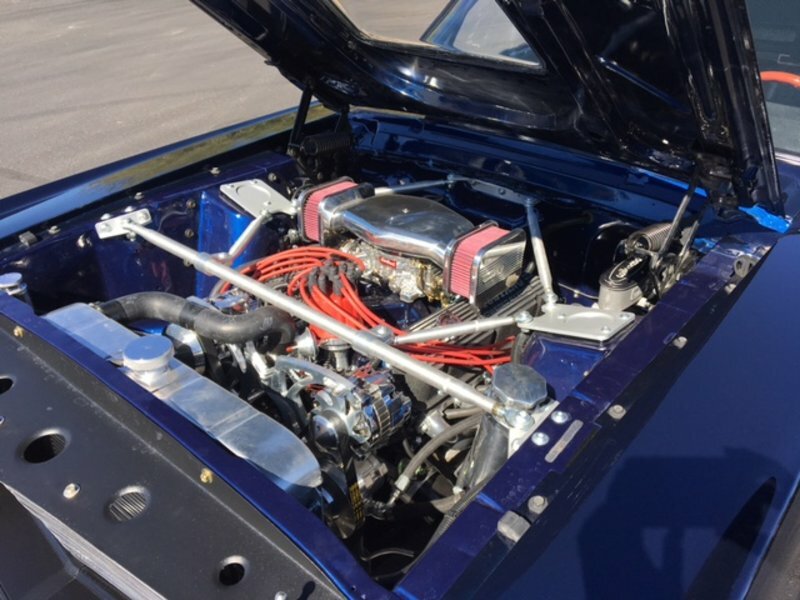 The motor is a 331 Stroker backed up by a built automatic transmission. It has a structure kit built into the car to handle excess horsepower. Modern luxury options like air condition power steering upgraded suspension, wood with stainless paneling and a stereo that rocks! More times then not custom cars builders claim one of a kind and all they do is bolt on parts purchased and built by other companies. Desert Classic Mustangs has gone to the effort to ‘create parts’ for the creative end result of Extraordinarily! Its not only wild its extreme. Poly carbonate Window Hood so you can see the motor. There are heat extractors built into the hood. And the custom design flows onto the cowl panel to the windshield. The cowl panel has the air vents blocked off and there are no wiper blades to distract the beautiful design. After all no one would drive this car in the rain. It has hand built Custom Side fender vents and is the first Mustang ever built with a Split bumper design. The exhaust pipes exit the rear center and this is first Mustang with Gemstone door handles. The rear deck lid has a motorized wing like the McLarens. At night while at your favorite car show you can flip the switch and light up the led lights underneath the Window Hood for a WOW effect. No need to raise the hood to show off the beautiful racy power plant. The car also features wheel opening flairs molded on and fit perfect to the lower rocker panels far from what Ford made. 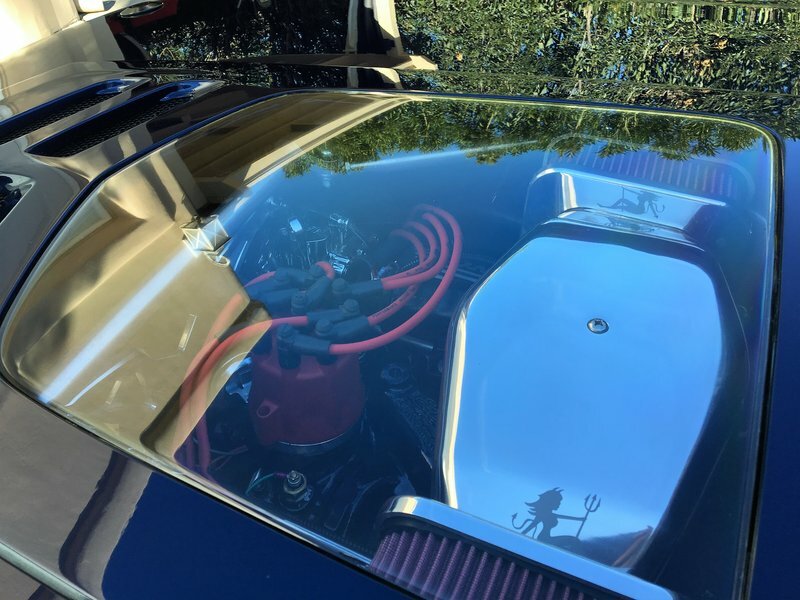 The upper vents are not from 67-68 Mustang louvers but look unique and have the Stainless Bubble design molded in for a distinct design. The rear tail light panel won’t be forgotten as you’re leaving someone in the dust, and the front end won’t be forgotten as someone sees the magnificent sleek front end fly by! The Interior has an innovative Lighting Rod Super Shifter with a custom console truly another one of a kind. The interior has a dazzling custom hand made stainless bubble instrument dash with matching door panels. Another surprising custom feature the interior has is an Exotic Bubinga Wood rear deck flooring with polished stainless trim. This 1/2" thick wood is only found in Equatorail area of South Africa. The Crow racing seat belts will secure you into the plush seats as you cruise your favorite roads! The Venom Series gauges light up bright against the custom hand built stainless bubble design dash. The car also features a larger screen Stereo and a lighted push start button. The are 2 10" subwoofers hidden underneath the rear wood deck. The stereo effects are heart pounding! 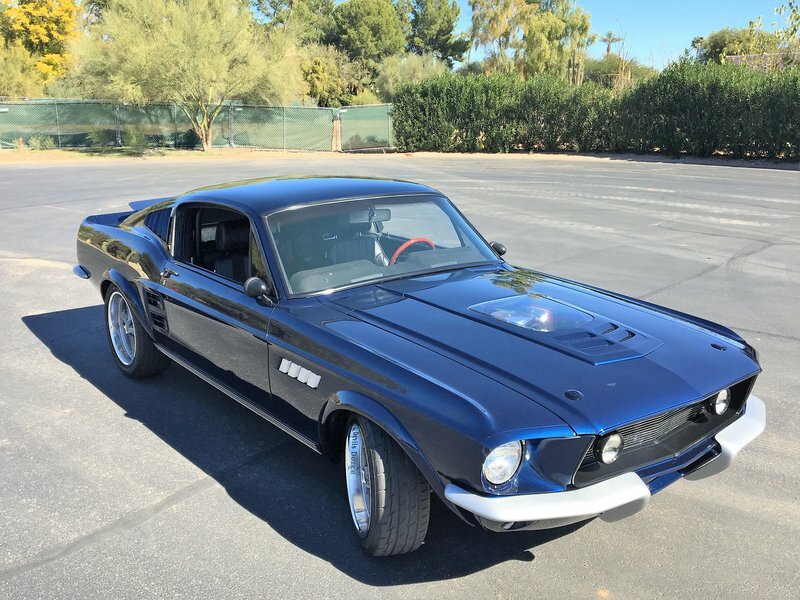 This car is built by Desert Classic Mustangs in Scottsdale, AZ. They are know worldwide for building custom Mustangs such as Shelby Eleanor Bullitt and Right Hand Drive Mustangs. Devils Dozen Number 1 of 13 to be produced. They can be ordered with different designs, choice of colors, choice of power plants , transmission and other options. Truly One of a kind only 13 will be built! Devils Dozen 1 of 13 available now! Below are only a few of the items that make up this beauty. Other people will want to copy our ideas so by listing the items there will be no need to answer emails on what was used. The buyer will get more that what is listed because we cant reveal everything. Deluxe Deluxe door panels with STAINLESS BUBBLE DESIGN INSERTS made and sold by Desert Classic Mustangs. Has Center Lokar E parking brake. Rear Deck Exotic Bubinga 1/2" wood ONLY from Equatoral area of South Africa. Has over 15 coats of clear varnish to enhance the beautiful design of the wood. Built by Desert Classic Mustangs. Polished Stainless slats. Decal Package, Devils Dozen 1/13 rear deck, lower rockers, wheels and flip fuel cap. Sound and Ceramic coating the entire inside of the car. Better than Dynamat. Shifter Automatic Ratchet Type Very Intimidating, we get more comments about this and what color the paint is…………. Seats Made by Procar Rally 1000 Ser. Seats platforms have been moved back 3” to provide more legroom.Still slide forward so your wife can s drive the car. Seat brackets have been lowered by 1 notch. Painted Black Steering Colunm with tilt. 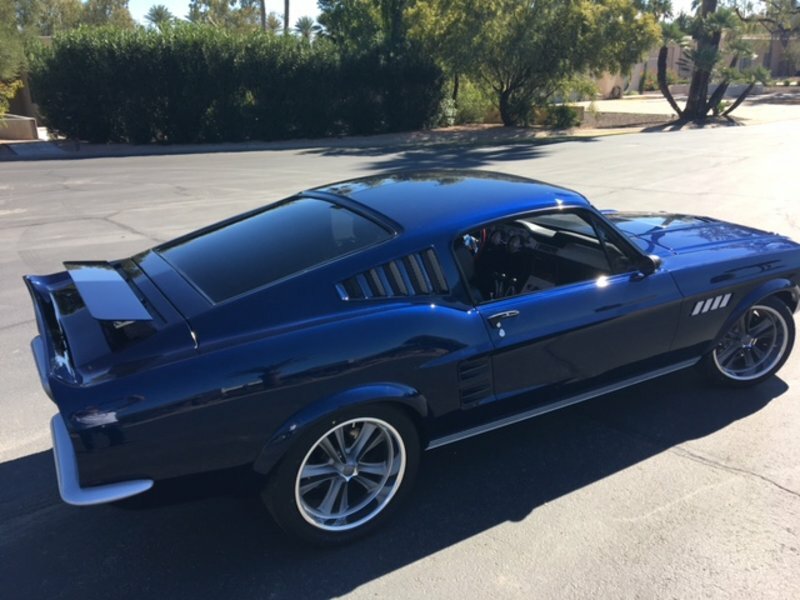 Paint “BLUE” Special by Desert Classic Mustangs. Hood, steel with Poly carbonate Window Hood 2 piece flow onto the cowl, made by Desert Classic Mustangs, over 100 hours to build and available for sale. Has heat extractors. LEDs under hood to light the power plant. Grill vents and windshield wipers and holes have been removed. Bumpers, Split bumper designs built by Desert Classic Mustangs and available for sale. Side fender vents with heat extractors, brushed finished, built by Desert Classic Mustangs often seen on our cars. Door Handles by Ring Brothers set with a 3ct diamond look alike. Stone is channel set by the owner of Desert Classic Mustangs who is also a master jeweler/designer. All new glass,back window has tint, other glass is smoked. Rear deck lid is steel with a motorized wing. Sets perfectly flush or raises up higher than what you seen in the pictures. Works off of a remote but can be wired from a speed or brake sensor. Same design as the Porsche, Lamborghini, Ferrari and McLaren. Over 100 hours to build. Built by Desert Classic Mustangs and for sale not only for Mustangs but for other cars. Total WOW factor at the car shows. Custom Exhaust, Gas tank had to be raised to get this cool option into play. Another WOW factor at the car shows. This may start a new fad like the split bumpers. All exterior stainless has been powered coated. Upper Vents, The openings for the upper vents had to be cut in and modify to make these vents fit. Stainless bubble design was hand built and sealed in to make this happen. Over 50 hours to make this happen. Very Cool design to match the interior panels. 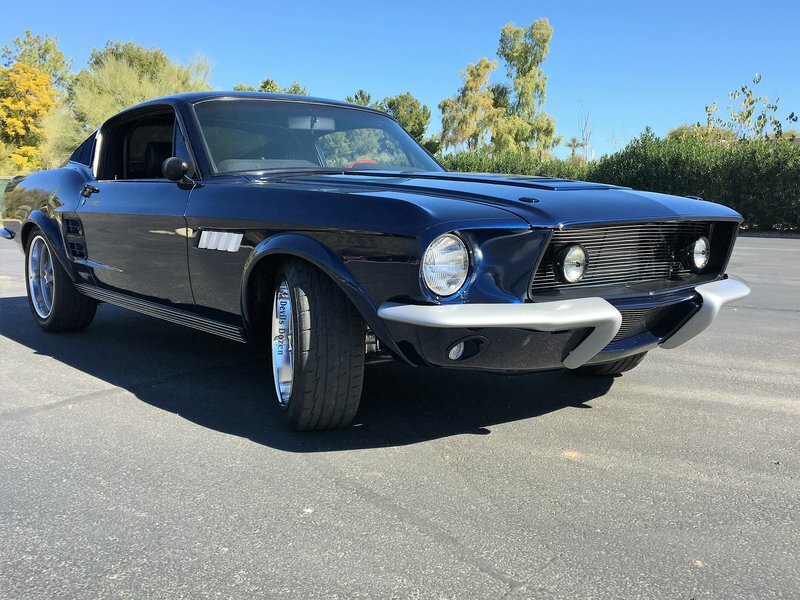 Available for sale, built only by Desert Classic Mustangs. Lower Side Quarter Panel Vents, simple mod, even a cave man can do it but never seen before until now. Black Mirrors, not much to say about these but they are different from stock. Painted to match the outside of the body. 331 Stroker motor with plenty of power. 4 barrel carb, coated headers, structure kit from TCP. Flowmaster 40 series h pipe with break-away-kit, loud enough to scare you neighbors kids. Modern Air Compressor and Power steering. March Performance front runner system with a lots of bling. Sealed with Epoxy primer and the coated with Duralinner for a rock hard finish to protect from the road. Structure kit built in by Desert Classic Mustangs so the car can handle excess power and torque. Transmission painted to match the motor. Total Control Front Suspension with adjustable upper a arms and coil overs. TCP strut rods all new. Rear Wilwood brakes, Stops on a dime and get .09 cents back. Room for a suit case full of money and a bottle of Fireball. Over-sized gas tank with a warp around reinforcement and slightly raise from the trunk floor. Coated area to protect it. Gas tank built by Hot Rod City Garage. Total Custom Built Cars from Mild - Wild - Extreme. Please talk to your wife before you call us! NOW TAKING ORDERS FOR THE ALL NEW 1965-1968 MUSTANGS WITH THE “HEMI FORD OR COYOTE MOTORS” CUSTOM BUILD TO YOUR NEEDS. AVAILABLE IN LEFT HAND OR RIGHT HAND DRIVE! 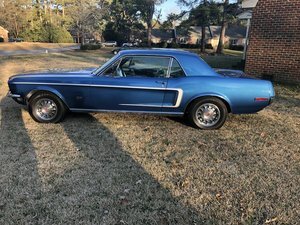 We build one of a kind Mustangs, Camaro's and other muscle cars!. Anything from mild to wild can be done. Bring your imagination to life! We design and build Cuda's El Camino, Challenger, and other muscle cars from the 1960s and 70s.